Archers take aim during an after-hours bow and arrow league at Goods for the Woods in Durango. The 15-week league allows hunters and hobbyists to sharpen their skills during the winter months. Think bowling, but with a deadly weapon. Since 1987, the locally owned Goods for the Woods outdoor retailer in Durango, located in Bodo Industrial Park in Durango, has been providing outdoorsmen and women with all their firearm and archery needs. The store, since its inception, has been owned by a mother and son team, Jane Gustafson and Seth Taylor. The duo even decided to branch out this past year, opening a shop in Cortez. But when the doors close and lights go down around 6:30 p.m. after the working day is done in Durango, the store transforms into a sort of bowling alley for bow hunters. 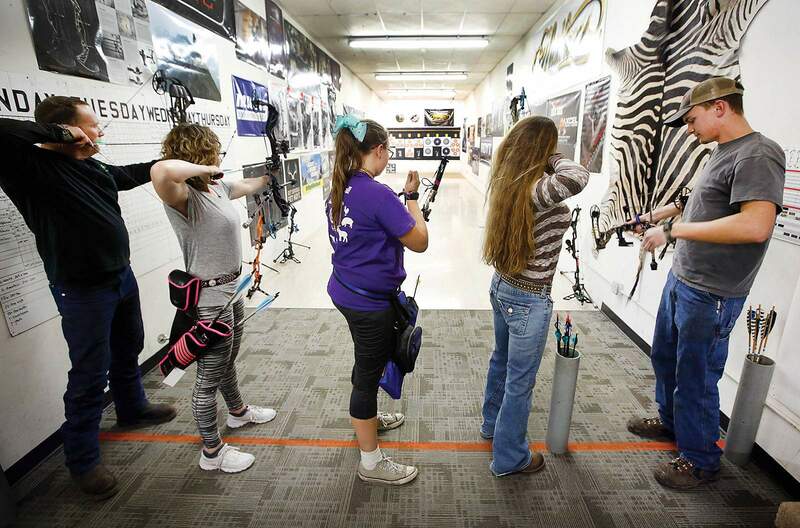 Since Goods for the Woods moved to its current location 16 years ago at 307 South Camino Del Rio, near the Office Depot shopping center, the store has offered an after-hours archery club for hunting aficionados. Sign-ups are usually held around September, with the league getting into swing after Thanksgiving. For 15 weeks, a stiff but good-natured competition lasts until winners are announced at the end of March. This year, the league had to expand to four nights a week – as opposed to the typical three nights – given the number of people who signed up. More than 100 competitors participate in both the Durango and Cortez leagues, Gustafson said. Ages and skill levels are across the board. Mikayla Cassady is one of the youngest bow hunters in the league, though she’s probably more advanced than the average shooter. The 11-year-old started hunting when she was 8, and now competes in more than 20 outdoor and indoor tournaments a year. Mikayla holds records for her age bracket in both Colorado and New Mexico, she said. Mikayla’s father, Jason, said he’s been hunting since 1998, and then started getting involved in the massive and competitive world of target archery, which he has taken part in all over the country. Jason and his family traveled this winter to Las Vegas to compete in the largest archery tournament, which draws more than 5,000 archers. Taking part in the Goods for the Woods league is a good way to keep skills up, he said. Bill Wolvin, an avid elk hunter who uses a traditional bow, may be considered a rookie in the league, but he’s no novice in bow hunting. He’s been an archer since 1969. More than anything, the league is a good place for hunters to come together in the winter, socialize, share stories, talk about gear, keep their skills sharp and prepare for the next hunt. Even after the winners are declared, everyone in the league wins with an end-of-the-year barbecue. After-hours archery club Goods for the Woods hosts an after-hours archery club, which gives hunters and hobbyists something to do in the winter and keeps their skills sharp. Goods for the Woods hosts an after-hours archery club, which gives hunters and hobbyists something to do in the winter and keeps their skills sharp.